Piano is one of the most popular starting instruments for music lessons. While piano can take a lifetime to truly master, the piano is one of the simplest instruments to operate on a basic level. The piano is comprised of 88 keys, each operating a hammer, which then strikes between one and three strings. Each of these keys is easily used, which allows even the most inexperienced of players to begin the journey into the world of music, making it a fantastic starting instrument for the oldest or youngest beginners among us. One of the most central instruments to the western music tradition, a significant portion of our ideas about music, harmony, and theory stem directly from the piano. 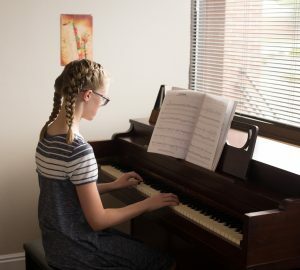 Because of this intimate link, piano players are forced to conduct a thorough study of music fundamentals, which easily translates to other instruments if the student decides to switch instruments later. 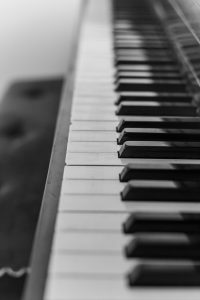 In America during the 1800’s, pianos were as common in household common rooms as stereo systems and televisions are today. The keyboard itself even predates the invention of the piano. The pipe organ, clavichord, and harpsichord all predate the invention of the piano at the end of the 1600’s. An incredibly flexible instrument, pianos, keyboards, electric pianos, organs, and synthesizers can function in any genre, perform with any sized group, or even solo. Amplified, acoustic, or synthesized, keyboards are an important part of almost every style of music. The keyboard is also one of the most common MIDI instruments. Technology has become indispensable in the creation of modern music, and mastery of the keyboard easily translates into compositional flexibility in the digital world. Using MIDI (Musical Instrument Digital Interface) instruments, a keyboard can be assigned an infinite number of different voices, allowing a proficient player to create entire ensembles worth of different instrumental voices, seamlessly integrating into a computer DAW (Digital Audio Workstation) for recording and composition. We have a wide array of talented teachers, with musical backgrounds in many different styles of music. We can coach students of any skill, experience level, or age, from the youngest of kids to the oldest of retirees, and music can be an enrichment to any lifestyle! Copyright 2017, Rocky Mountain Academy of Music. All rights reserved. | Powered by CyberBasement.